ARS NOVA Copenhagen og Paul Hillier præsenterer her den fjerde indspilning i en serie helliget Heinrich Schütz' (1585-1672) narrative værker (Historiae). Det danske vokalensemble fejrer således Danmarks stolte forbindelse med denne tyske mester, som blev udnævnt Kapellmester af Christian IV og arbjedede ved det danske hof over to perioder igennem 11 år. Cover-illustrationerne viser relieffer i hamret metal af Karl Schmidt-Rottluff (1884-1976), et medlem af Die Brücke-gruppen grundlagt i 1905 i Dresden - en by, med hvilken Schütz selv havde en tæt tilknytning. "For the first time we have access to truly excellent performances of all three Passions"
"Som et korrektiv til alle de overfladiske ting, der dominerer i samtiden, er det fremragende." "En udgivelse af internationalt format"
"Esta nueva versión frente al conjunto Ars Nova de Copenhague contiene no menos virtudes, con un extraordinario Julian Podger como evangelista y un coro sobresaliente." "The recording is almost superb"
"Individual step-outs ensure that chanting is dramatically engaged and the consort singing is flawless." 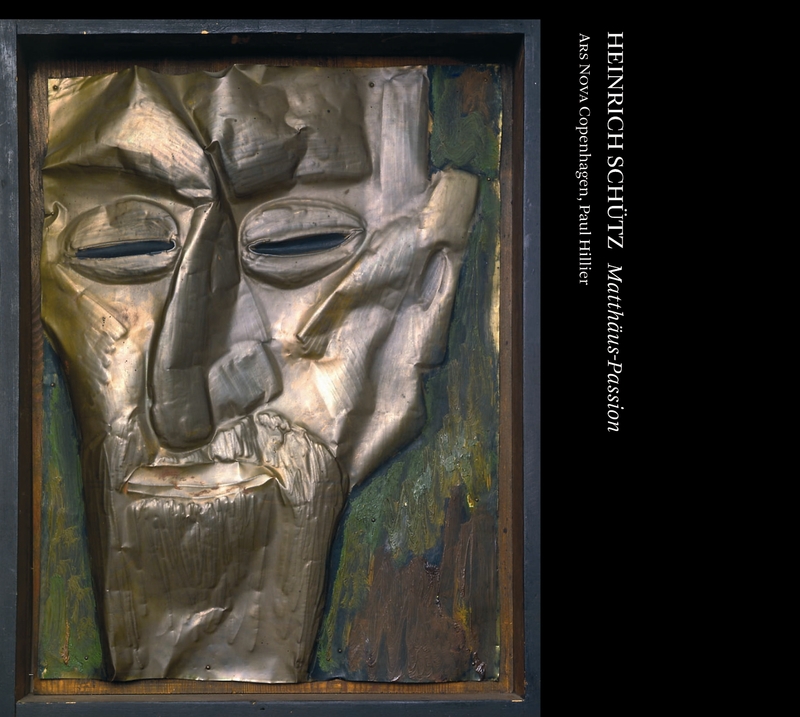 "Well recorded, in warm acoustic, this is a worthy completion of Hillier's collection of all six of Schütz's narrative works." "Im besten Sinne lässt der erfahrene Engländer erzählen - dramatisch, plastisch, lyrisch, entlang des fesselnden Passionsgeschehens." "Hillier and his Copenhagen players are born to this music." Und es begab sich, da Jesus alle diese Rede vollendet hatte 12:03 12,80 kr. Da kam Jesus mit ihnen zu einem Hofe, der hieß Gethsemane 7:49 9,60 kr. Die aber Jesum gegriffen hatten 4:04 6,40 kr. Petrus aber saß draußen im Palast 11:40 12,80 kr. Und da sie ihn verspottet hatten 10:37 12,80 kr. Und am Abend kam ein reicher Mann von Arimathia 4:00 6,40 kr. Schütz made the decision to set his St. Matthew Passion with the words of the Evangelist and individual speakers presented in newly-composed unaccompanied intonation. He complemented those sections (which account for the vast majority of the work's text) with settings of the words of groups mostly for four voices. The scoring of these sections brings with it several distinctive musical features: These passages are metrical (with a regular pulse and with an organization of beats into regular groups); they are harmonized (resulting from the combination of voices, in contrast to the unaccompanied intonation of the rest of the text); and they allow for the polyphonic interaction of the voices with each other in various ways. These sections sound a great deal, in fact, like works in the inherited tradition of vocal polyphony, the legacy of the 16th century still pursued (in a more modern musical language) by Schütz and his contemporaries in collections like the composer's own Geistliche Chormusik. There are differences, of course-the sections in the St. Matthew Passion are very short compared to free-standing compositions-but in many respects these passages draw on the same techniques as their models. One way to hear these passages, which certainly stand out to the modern ear, is to listen for features Schütz borrows from these larger pieces. And it is not difficult to discern some basic patterns the composer adopted in setting these kinds of words throughout the passion. The passion movements that most closely resemble freestanding polyphonic compositions are those that set long texts. In these pieces (Andern hat er geholfen,\ "Herr, wir haben gedacht," and the slightly shorter "Der du den Tempel Gottes zerbrichst"), Schütz sets each of the texts' many phrases as its own unit, marking new textual phrases by changes in musical texture, melodic material, level of rhythmic activity, and so on. In essence, he borrows the compositional construction of the motet, in which each phrase of text receives its own setting completed with a cadence before the next is begun. Given the length of the texts, most of these settings are homorhythmic (with voices declaiming together to move efficiently through the words), with only a few passages using the voices in independent imitation of each other. These pieces in the St. Matthew Passion are miniature motets. At the opposite end of the spectrum are the settings of short texts in the passion, which Schütz typically treats by presenting the text once through. Examples include "Wo willst du, daß wir dir bereiten?" "Wahrlich, du bist auch einer von denen," and "Der rufet den Elias." A few of these sections are briefly extended in various ways. "Herr, bin ich's?" is amplified by the repetition of the textual phrase "bin ich's," clearly in loose illustration of the voices of the many disciples who ask the question "Is it I?" "Ja nicht auf das Fest" is rounded off musically and rhetorically by the emphatic repetition of the opening assertion "Not on the feast day" at the end of the setting. The very shortest texts are presented with artful repetition. The single word "Barrabam" is presented repeatedly both on and off the beat in each of the voices, confusing the musical meter and suggesting a kind of continuous outcry (even while not being literally representative). The two identical settings of "Lass ihn kreuzigen" and portions of "Gegrüsset seist du" are in homophony with one offset voice. By these means, Schütz slightly elaborates a simple declamation of these short passages. One of Schutz's most common models in the St. Matthew Passion is the presentation of a text twice through. The sections "Weissage uns" and "Gegrüsset seist du" do this, as does "Sein Blut komme über uns." The setting of "Halt, lasst sehen" is similar except that it repeats only its final words. This is a tendency that can be heard throughout the passion setting; the repetition of the ending words of a text helps contribute to the finality of its cadence. "Wozu dienet dieser Unrat" employs a version of this technique, presenting its opening phrase once but its second twice. "Wahrlich, dieser ist Gottes Sohn gewesen" works much the same way with an important variation: its opening word ("Wahrlich") is treated in a strikingly elaborate fashion, emphasizing a theologically important moment. This demonstrates another important strategy: the isolation of a single attention-grabbing word, often presented in long notes, at the start of the text. This is a borrowing from motets, which typically start with slow note values and with some kind of rhetorical exordium (call to attention). The clearest examples in the St. Matthew Passion are "Herr, bin ich's?" with its voice-by-voice opening statements of "Herr"; and "Wahrlich, du bist auch einer von denen," which presents its opening word in long note values simultaneously in all voices. Clearly related is the setting of "Sein Blut komme über uns," in which the opening words of this troubling text ("Sein Blut") are isolated and dwelt upon. Schütz has several techniques for suggesting the participation of many people in the groups whose words are quoted, even when the musical setting might well be performed by only four singers. Text repetition is one, as in "Herr, bin ichs?" Another is the suggestion of a double-choir setting in at the opening of "Halt, lasst sehen," in which the lower three voices (alto, tenor and bass) and then the upper three (soprano, alto and tenor) present the first words in turn, simulating the effect of opposed choruses. There is even some broad symbolism in the scoring of several movements. The words of the two false witnesses ("Er hat gesagt") are presented by exactly two singers, as might be expected; Schütz further puts most of their music in strict canon, perhaps to suggest their lack of independence from each other. Essentially all of the other multi-voice movements are for soprano, alto, tenor and bass, but two are scored for low voices (alto, two tenors and bass). These are two of the passages spoken by the high priests (in one case together with the elders), "Was gehet es uns das an?" and "Es taug nicht." By his choice of scoring, which eliminates the soprano line that would most likely have been sung by younger boys and turns to the three lines typically sung by adult male singers, Schütz briefly hints at a depiction of words he otherwise gets across by his control of musical material and by his borrowing of techniques from vocal polyphony. With this recording of the St Matthew Passion we complete our current Schütz series, and a word or two about the ideas behind it and the process of making it may not be out of place. I wanted to record the narrative works of Schütz because I am interested in singing stories. There is plenty of vocal music that does other things of course - describing nature, professing love, celebrating wine, uttering a prayer, decorating a ceremony; we choral musicians frequently make whole concerts (or CDs) of such things, using contrast and balance to try and hold the audience's interest. But when you take a sequence of songs and weave them together into a narrative of some kind, then you create something that is more than the sum of its parts, and each element resonates with added meaning. With songs, as with poems, we need some kind of context in which to position ourselves in relation to what we are hearing, some kind of narrative (in the broadest sense) that helps us find our place. And it was this general concern that led me to plan the present series. Although Schütz is a major figure in the history of music, he is not so often performed. I put this down to the usual early music problem: lots of pieces, mostly rather short (three to five minutes typically); and to do Schütz justice you need a rather unusual array of voices and instruments, at a cost that is normally only justified if you can use them for a whole concert. But I do enjoy his music, so I looked again and noticed that - of course - six of his largest works are ones that tell a story, using a narrator and several characters. What worked in new music would surely work in old: and quite suddenly I had the idea that we should perform and record all of them over a period of four years. It would require careful planning, so that the preparation and performances of each work could be followed by the recording of them - after a little pause to allow the experiences of performance to sink in. This would lead to the publication of the CD in the following season, by which time we would have moved on to the next work(s). This meant that for several seasons in a row our Easter offering would be a Schütz Passion - and I hoped this would not be detrimental to our box office receipts (such as they are) nor exhaust the patience of our regular audience in Copenhagen! Fortunately this was not a problem and the Danish audience proved very receptive to the music. There are several reasons for this. First, Denmark shares very closely in the Protestant tradition that we more widely associate with northern Germany, and the musical links throughout the area are just as deeply interwoven: the music's message is ‘local'. Second, German is widely understood and spoken here (as is English), and therefore audiences are able to hear texts sung in German and understand them without necessarily having to bury their heads in a printed translation. There can be no doubt that a feeling of linguistic familiarity with words sung transforms the listener's experience. Third, the Danish church, which still enjoys State support, is active as a promoter of concerts. Many (perhaps most) of the local village and town churches maintain some kind of musical season, which is well supported locally. This has the happy tendency to turn a concert into an event that is still rooted in a local sense of community, with a sense of identity that goes beyond the merely aesthetic concerns of a music club or festival. Schütz did in fact spend several periods of his career here in Denmark, where he was greatly appreciated. Indeed it was this association that first prompted me to focus on Schütz and it has led me to a deeper historical appreciation of the cultural interdependence of all the countries hereabouts: Germany and Denmark, yes, but also England, Scotland, Norway, southern Sweden, and Holland. One of my first decisions in planning the series was aimed at creating a natural variety in the Passions by choosing a different tenor for each Evangelist, while keeping the same bass singer as Christus - who remains the fixed point of focus. Schütz already helps us by casting each Passion in its own mode, which has a profound effect on the harmonic coluring not only of the polyphony, but also of the monophonic chant (about which, more in a moment.) I feel that this has worked even better than I dared hope: each of our tenor Evangelists has his own very distinct way of telling a story and this inevitably coloured our collective response to each of the three works in turn. Of course, take any three singers and they will always have different performance mannerisms, but individually our three Evangelists are singers who have already immersed themselves in baroque performance and developed their own sense of style in the light of that. The various other roles in the stories are taken by members of the chorus, and here we enjoyed ourselves in seeking out suitable characterisations, having in mind that Schütz is known to have composed operas (including during his time in Copenhagen) - although, sad to relate, these have not survived. In addition to variety I also wanted continuity - as of a repertory company. Therefore in the non-Passion works I called upon the same individuals plus soli from the chorus to present the various roles and to sing as a consort in The Seven Last Words. The six pieces we have now recorded rank as some of the finest of the 17th century: three Passions (Matthew, Luke, John,) which are entirely unaccompanied, and three works that use a variety of instruments: a Christmas History, the 7 Last Words, and the Resurrection History. The Christmas History is fresh, tuneful, and crisply characterized through its instrumentation. It was the first work by Schütz I ever encountered - I sang the bass solo in Bridport (in Dorset) when I was about 17 - and I have held it in special affection ever since. The 7 Last Words is an ineffable masterpiece. To be honest, I only added this to the series rather late in the day. I had not thought of it as a ‘narrative' work, given its serene, contemplative character: but it does indeed narrate, and forms a link between the Passions and the following piece. The Resurrection History closes the narrative sequence, though it was the first to be composed and is the nearest in feeling to Schütz's mentor, Monteverdi. It presents two unusual and highly effective novelties: the narrator is accompanied by a quartet of viols, who are instructed to improvise following the singer and using the chord patterns provided; while Christus (like Mary Magdalene) is represented by two voices singing in duet. Although there is much to say about the musical fabric of these works, the thing which struck me most forcefully as we engaged with the three Passions one after the other, was the unending variety and expressive virtuosity of the quasi-plainchant that Schütz invented for the Evangelist, Christus and other characters (only the chorus sings polyphonically). To appreciate what he accomplished I think two things are important. First, to understand that while to imitate chant is easy, to do it well and with any sense of authentic creativity is extremely difficult! Second, we should remember that by this time the tradition of continuo accompaniment, rooted in the harmonic relationship between melody and bass part, had been the basis of composition for two generations of composers. The old style of imitative polyphony was still used, but mostly for its symbolic value to mark moments of special solemnity. Schütz had been schooled in that style and heartily recommended it to younger composers, for whom he felt the basso continuo was too often relied upon as an easy option. It is not surprising therefore to find him writing imitative polyphony - but that is something quite different from monophonic chant. In his ‘chant' Schütz in fact creates something new. Certainly he is looking back to the ancient tradition of chanting psalms and gospel lessons. But he is also well versed in the newer kind of monody - the sort with basso continuo - and its harmonic underpinnings. In writing unaccompanied chant in a style that respects the venerable tradition standing behind it, yet allows itself a degree of affective expression suited to more modern expectations, Schütz achieves a remarkable balancing act. Taking my examples only from the present Passion (the St Matthew), we can hear right at the outset that the Evangelist begins in a very traditional manner, reciting primarily on a single pitch (Bb - not in fact the tonic, the work is in G minor), with a signature dip on the third syllable (Und es begab sich), a half-cadence to the median pitch of A (vollendet hatte), and then another signature formula, this time more lyrical, to cadence onto the tonic G (sprach er zu seinen Jüngern). Christus responds in a similar manner, approaching his reciting pitch of G from below, and with an expressive flourish on the middle syllable of gekreuziget. In the next passage the Evangelist takes his recitation up to a higher pitch (D), which provides musical balance, but also helps to open up our auditory perspective to picture the group of High Priests now mentioned. The name of Kaiaphas is carefully dropped in on a brief semi-cadence (F), which is echoed by the placing of töteten; and the passage concludes back on the first recitation pitch (Bb). Elsewhere we can find stronger elements of harmonic patterns being used to draw together a sequence of utterances by more than one singer. Kaiaphas sings Ich beschwöre dich (a little after the beginning of track 4) with a falling 5th outlining the triad of D minor. This initiates a passage built around interlocking 5ths, first ascending: dass du uns sagest (Bb - F), ob du seist Christus (C-G), der Sohn Gottes (D -A) ...stepwise! This is answered by Evangelist, now descending, Jesus sprach (C- F), and Christus, Du sagest es (A-D), Doch ich sage euch (G - C). Further 5th activity marks the next passage with Evangelist and Kaiaphas, starting at Da zureiss der Hohe-priester seine Kleider. A similar exchange occurs in the exchange with Peter (middle of Track 5) where Peter's descending A minor triad (Ich kenne des menschen nicht) is echoed and varied by the Evangelist (Und alsbald krähet der Hahn) to cadence on F. Soon after this follows a phrase by Judas with its chromatic colouring taken from the contrasts between Eb and En and Ab (Ich habe Übel getan, das ich unschuldig Blut verraten habe). While these harmonic outlines are very clear, there can be no sense of imagining a bass line, and certainly no feeling that an accompaniment is in some sense ‘missing'. Schütz has succeeded in creating his own monophonic world which holds itself together masterfully. Dacapo Records og Ars Nova Copenhagen takker Augustinus Fonden, Sonning-Fonden, Etatsraad Georg Bestle og Hustrus Mindelegat, og Generalkonsulinar Høyvalds Fond for økonomisk støtte til produktionen.